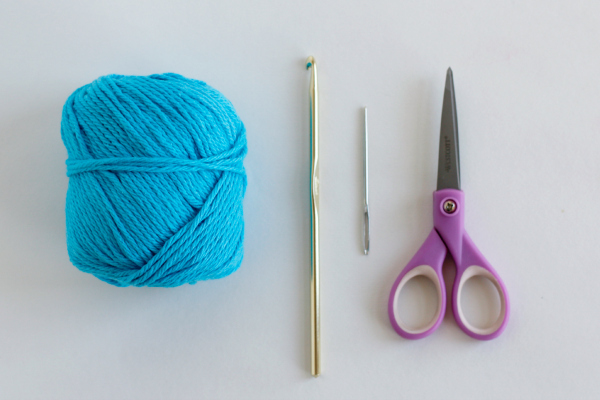 Ready for a super simple crochet project that you can do in a flash? 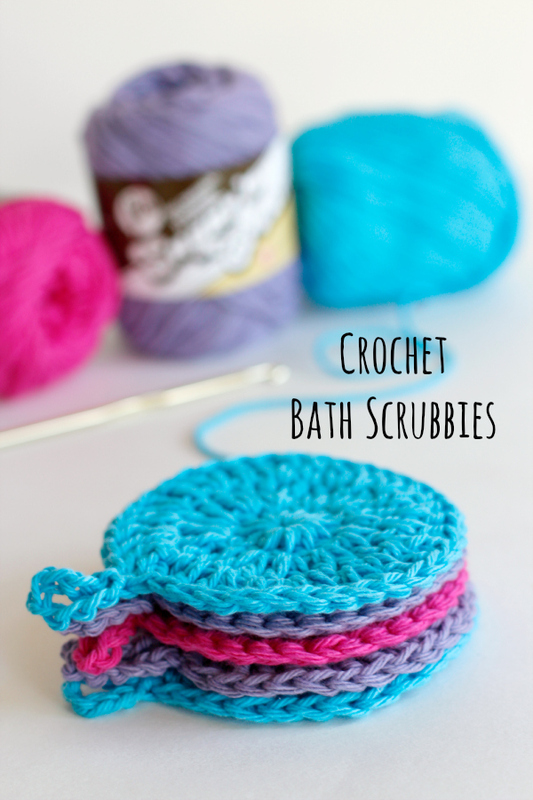 How about a crochet bath scrubbie, or two! 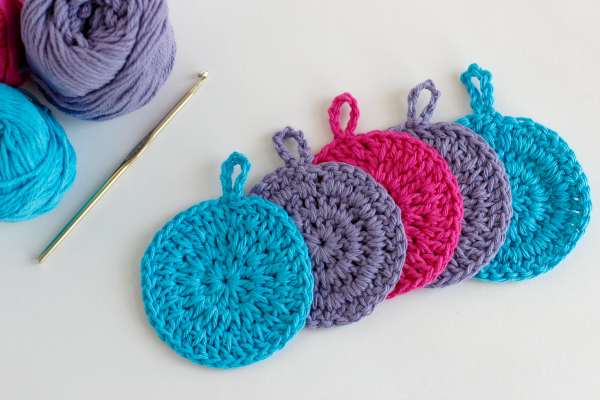 If you’ve been crocheting for a little while now, you could probably crochet one of these scrubbies in the time it takes to fill up the kids bath, they’re that quick! We’re having a lot of fun with bath products lately, as I posted our family’s favorite Homemade Bath Bubbles, complete with delicious smelling essential oils, yay! Now you have a bath scrubbie to use it with. These are ready to soap up and scrub away! 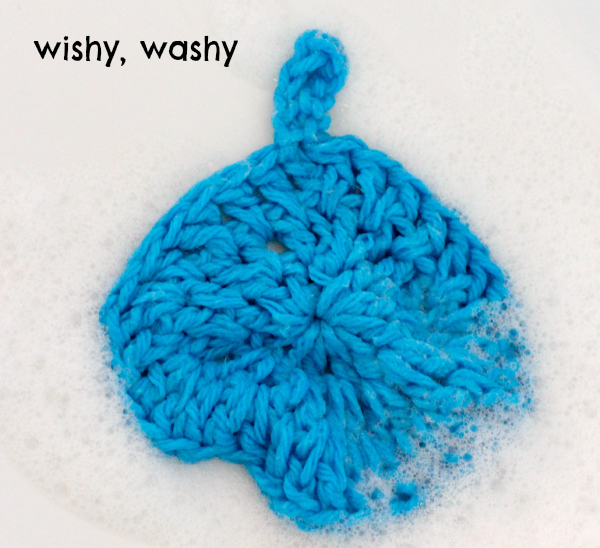 Since your crochet piece will be getting wet, it’s best to use cotton yarn, as this yarn washes well. I love the brand Sugar n’ Cream. It’s not as smooth as normal yarn to crochet on the hook, but it’s very durable and is great for a bath scrub. NOTE: this yarn color will bleed on first use. Before you scrub with it, rinse it well with soap and water. Then it’s ready for bath time and can be tossed in the wash with your dirty rags. 2. 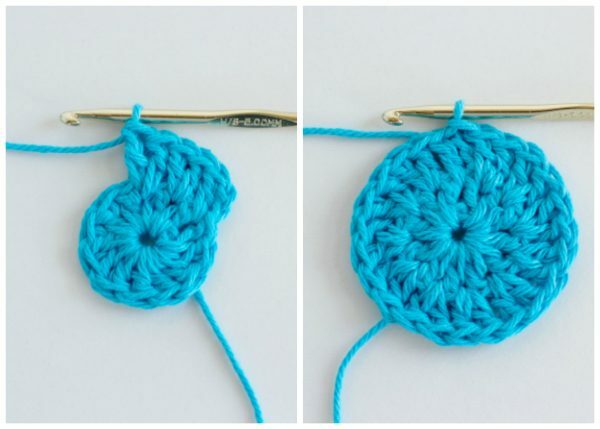 Slip stitch back through the first chain stitch to create a circle. 3. Chain stitch 2. 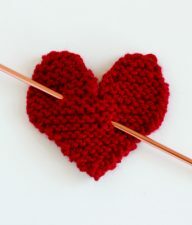 This will act as your first double crochet in this round. 4. Double crochet 11 more stitches in the center of the circle you made in step 2. 12 dc total. 5. Slip stitch through the top of the first chain of 3 to form the first circle round. 6. Chain stitch 2. 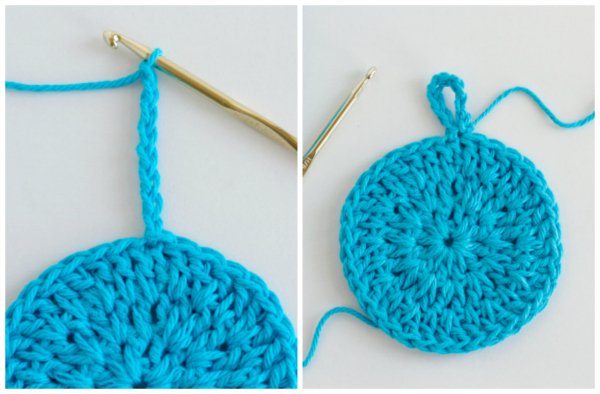 This will act as your first double crochet (dc) in this round. 7. Double crochet into the same stitch just to the left of where you chained, so there are now 2 in the same space. 8. Continue to double crochet 2 stitches into each of the remaining holes from the previous round. 24 dc total. 9. Slip stitch through the top of the first chain of 2 to form the second circle round. 10. Chain stitch 2. 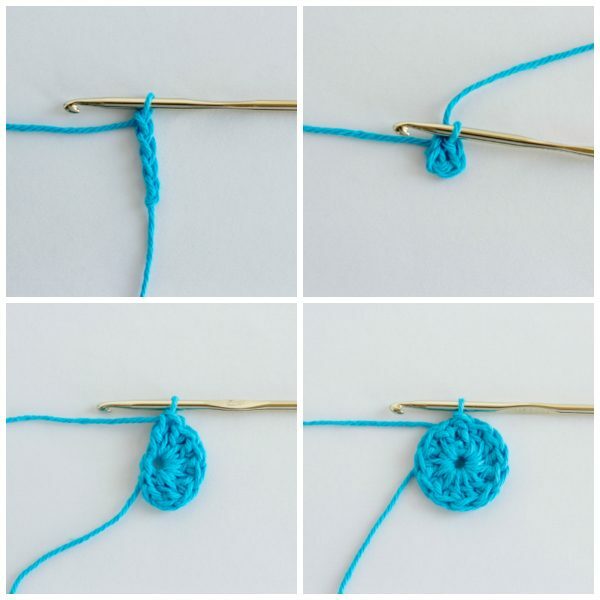 This will act as your first double crochet (dc) in this round. 11. Double crochet into the same stitch just to the left of where you chained, so there are now 2 in the same space. 12. Double crochet 1 in the next hole. 13. Double crochet 2 into the next hole. 14. Repeat this pattern around the circle with 1 dc and 2 dc all around. 36 dc total. 15. Slip stitch through the top of the first chain of 2 to form the third circle round. 17. 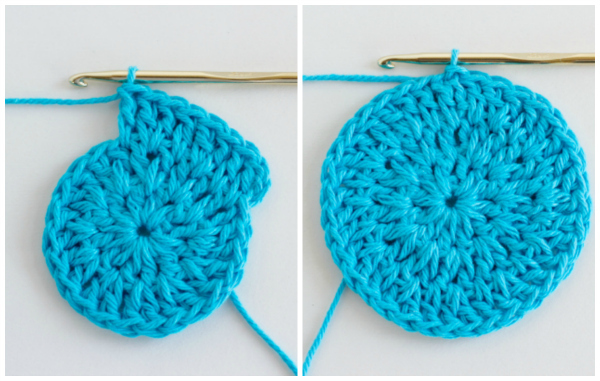 Slip stitch back through that first chain stitch of 8 to create a circle hook. 18. 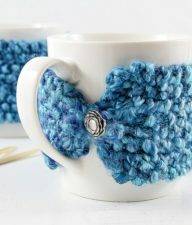 Tie off your yarn. Use your yarn needle to thread and hide all the tails. Trim any excess yarn. Now your scrubbies are ready for the bath. Make some in all colors! 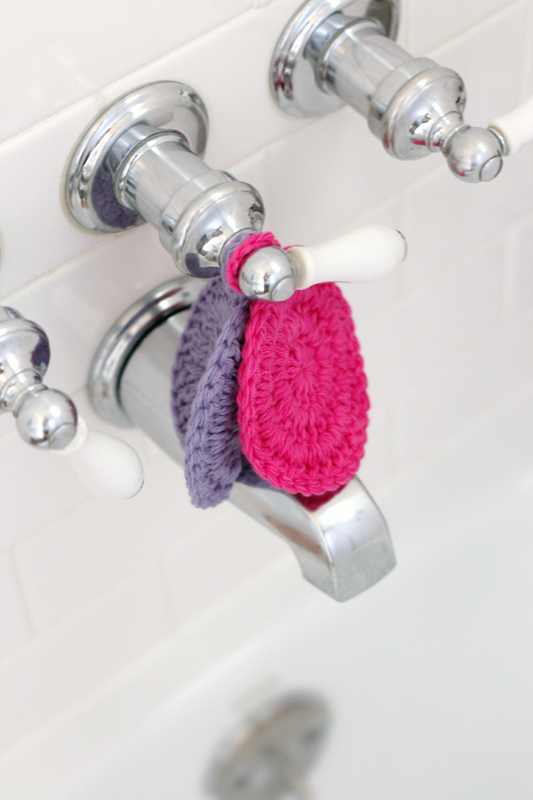 Hook your Crochet Bath Scrubbies onto the tub faucet so they’re ready to go. 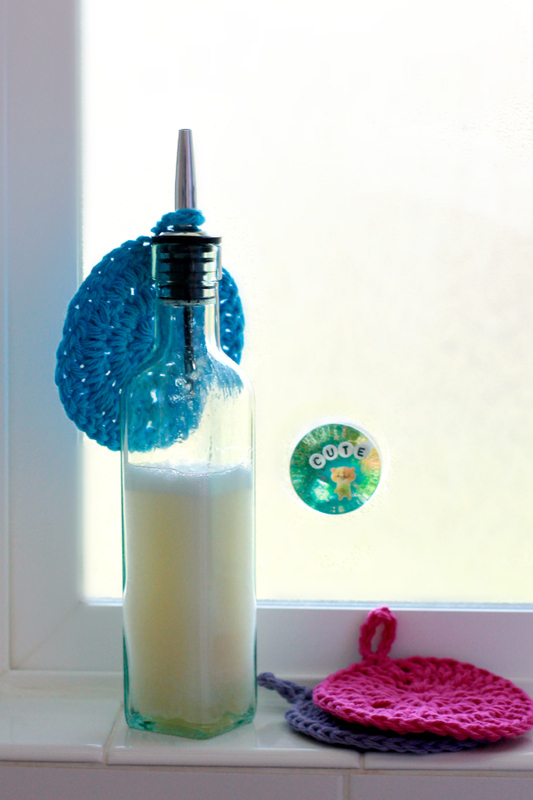 Or you can hook them onto your homemade bubble bath bottle! It’s ready for some scrubbin’! 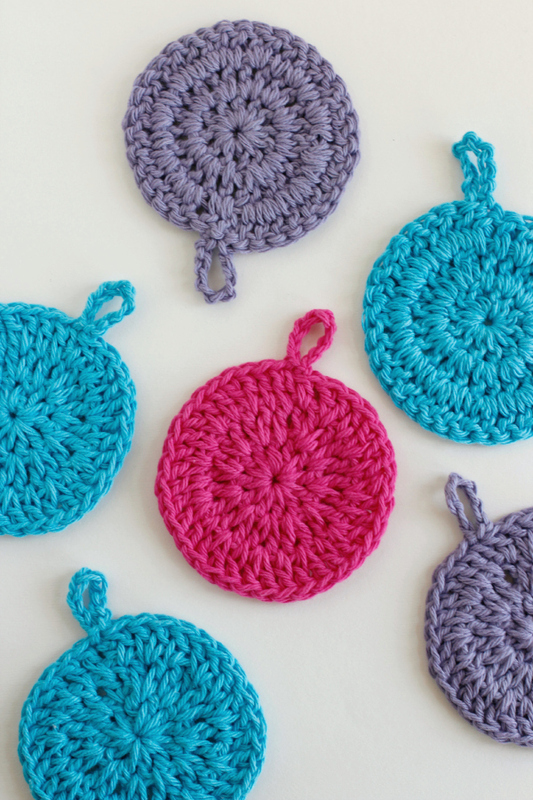 Have fun with your Crochet Bath Scrubbies for tub time! Slip stitch back through the first chain stitch to create a circle. Chain stitch 2. 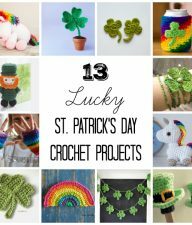 This will act as your first double crochet in this round. Double crochet 11 more stitches in the center of the circle you made in step 2. 12 dc total. Slip stitch through the top of the first chain of 3 to form the first circle round. Chain stitch 2. 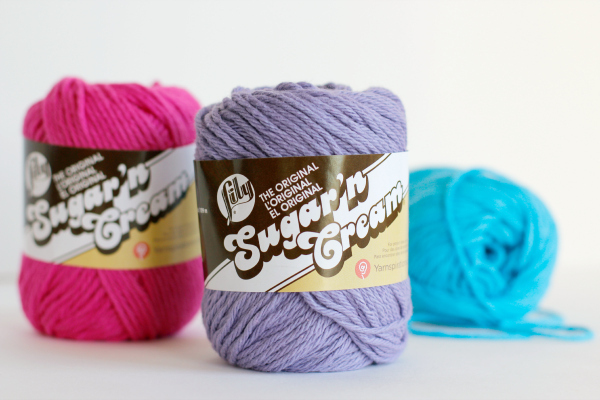 This will act as your first double crochet (dc) in this round. Double crochet into the same stitch just to the left of where you chained, so there are now 2 in the same space. Continue to double crochet 2 stitches into each of the remaining holes from the previous round. 24 dc total. Double crochet 1 in the next hole. Double crochet 2 into the next hole. Repeat this pattern around the circle with 1 dc and 2 dc all around. 36 dc total. 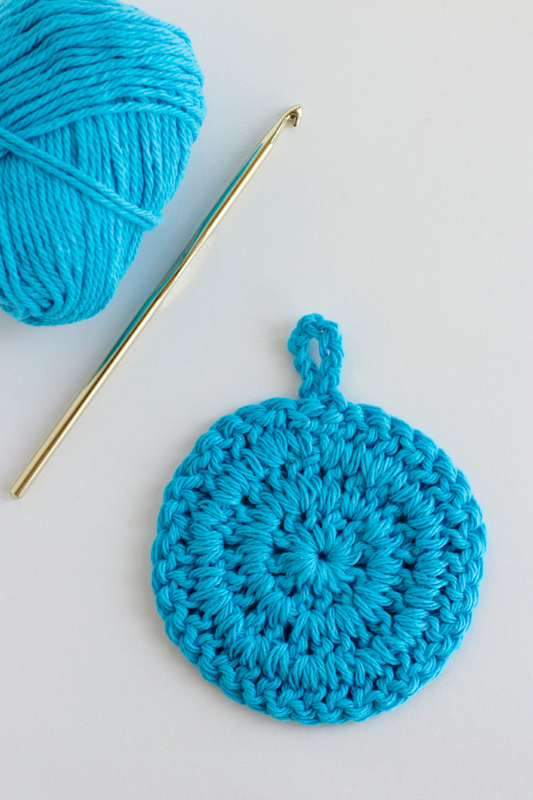 Slip stitch back through that first chain stitch of 8 to create a circle hook. 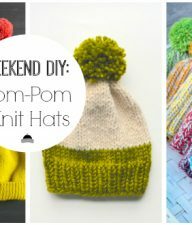 Tie off your yarn. Use your yarn needle to thread and hide all the tails. Trim any excess yarn. *This post contains affiliate links. Thanks for clicking and supporting Make and Takes. these are great. I made some for a co-worker, and she absolutely loves them and asked me to make her some more! Thanks for sharing! So happy they were a hit! I’m going to try this. Thanks for the pattern. That’s great! Please let me know how it goes!